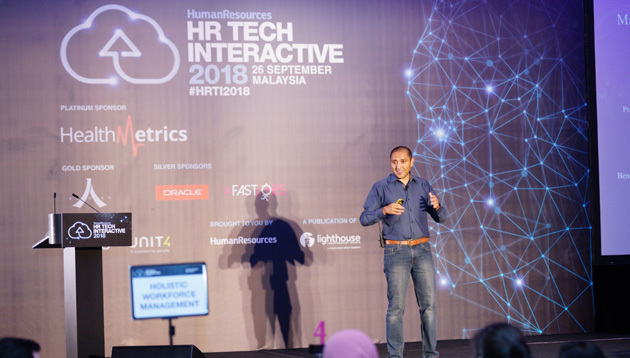 Keynotes with perspectives on digital transformation, case studies on a data driven approach to establishing employee value proposition, as well as four different interactive sessions were the highlights of HR Tech Interactive 2018, Malaysia. The fourth annual edition of Asia’s most specialised, invitation only conference on managing HR in the age of digital disruption was produced by Priya Veeriah, and attended by over 80 delegates. Held at Aloft Kuala Lumpur on 26 September 2018, a quick introduction by senior journalist at Human Resources, Jerene Ang, set the pace for the day, where she said: “In a survey of 500 managers, it was found that one-third of them spend about three to four hours per day on administrative things such as responding to emails and submitting expense claims. She went on to invite the day’s first speaker, who has extensive experience in digital and culture transformation as well as organisational development. As the head of employee experience at Maxis, Monir Azzouzi, played a critical role in transforming the HR department from a conventional unit to one that adds real value to the business by focusing on digitalisation and preparing the organisation for the digital age. Thar was followed by our first interactive session, with four table themes being facilitated by table hosts across the room – the first of which is workforce analytics, facilitated by Kamarunnihar Samad, general manager for human capital at ICON Offshore, and Yong Ei Ng, head of human resources at Ericsson. Following a short coffee break was a speaker who has led various digitalisation initiatives, bringing over experience in technology start-ups, pharmaceutical sales, medical affairs, healthcare delivery and pharmacy. Currently the lead business strategist at HealthMetrics, Max Thum, tapped on that experience to reveal how HR teams can leverage on technology to design and implement a flexible benefits scheme. Next up was another interactive session with one of the topics discussed being mobile HR. Table hosts for this topic include Jason Low, marketing manager at HealthMetrics, and Max Thum, lead business strategist at HealthMetrics. Following that engaging session, we heard from a speaker with more than 14 years of experience in the industry. Since returning to Malaysia in 2008, Sharma KSK Lachu chief executive officer of Accendo, has been on a mission to elevate the level playing field of ASEAN companies in the use of strategic HR tech. During his presentation, he tapped on his experience to share how HR technology can learn from the interactions in game theory. The post-lunch sessions started with two back-to-back interactive sessions. Topics discussed include HR cloud – facilitated by Daphne Lok, director of human resources for Southeast Asia at Surbana Jurong International Consultants, and Bernard Solomon, head of applications and human capital management applications for ASEAN at Oracle Malaysia – and holistic workforce management – hosted by Arulkumar Singaraveloo, director of human resources (business consulting and services) at Infineon Technologies, and Sameet Sidhu, senior HR business partner for Malaysia and Singapore at REA Group. The two interactive sessions were followed by an insightful presentation from someone who brings over a decade of commercial experience into HR to anticipate business challenges involving workforce transformation. Bilal Waris, head of organisational development and group talent management at Axiata Group, leveraged on that experience to share how HR leaders can capture data from social media to help develop an EVP that motivates young talent to join the organisation. After a refreshing afternoon break, we dived into a panel where four HR leaders discussed ideas for creating a seamless employee experience by investing in the right mix of HR tools. The discussion was moderated by Mohamed Parrish, group head of human resources at Sapura Resources, who was joined by panelists: Serene Tan, human resources director at Antah Schindler Malaysia; Sharmeel Kaur, head of human resources at DHL Asia Pacific Shared Services; and Joelle Pang, director of regional business development at FastJobs. The day concluded successfully with a summary of the interactive sessions where table hosts rounded up their key observations over the day’s conversations. With that, we came to the end of HR Tech Interactive 2018, Malaysia. As curtains close on this year’s edition of HR Tech Interactive, Human Resources would like to thank all speakers, panelists and table hosts in pulling together facts and case studies for insightful presentations. Thanks also to all delegates for their active participation in the event and leveraging on the various networking and interactive opportunities. Is this the sweetest way to say ‘I quit’? Forget resignation letters: A medical professional has revolutionised the exit-process by presenting an ' I quit' cake to her boss..
"Instead of competing for talent, companies need to collaborate for talent," said John Nolan, senior vice president of HR at Unile.. The cloud computing company scouted externally for the role of managing director in the JAPAC region. .. The children of MTR staff have taken on a challenge and were asked in an online video to describe their parent’s job - and laughte..